Our sport's minimal regulation was setup because the government essentially (and fortunately) lets us do our own thing, including hurt ourselves individually, as long as we don't take anyone up with us. No passenger, minimal regulation. But then you don't want to get hurt. This is aviation. We operate in the US Airspace system and missteps could ruin it for everybody, let alone the individual. Inadequate or improper training could result in student injury or death. We fly very unique aircraft who's handling and characteristics are not always intuitive. USPPA/USUA (and USHPA) instructors have demonstrated knowledge and skill in the flying of these craft along with how to handle numerous emergencies that can come up. While there may be wonderful and effective non-certified instructors out there, it becomes up to you to find out on your own. Just being certified does not make an instructor "good" or even safe. Nor does being an expert pilot. They must be good teachers, be disciplined and able to effectively communicate, among other things. Recommendation from a trusted pilot is a great reinforcement that your choice is a good one. The USPPA syllabus covers all the essential knowledge and skills that we feel should be included during training for the PPG1 (first solo), PPG2 (pilot) and PPG3 (advanced pilot) stages. The PPG2 rating is what we consider the minimum for a pilot to be ready to set out on their own. You should ask your instructor to go through the entire syllabus for the rating you seek. You both will initial each area covered. Humans are not perfect, even instructors, and this document helps insure complete training. The USHPA (US Hang Gliding and Paragliding Association) has a very thorough training and instructor program for paragliding. The USPPA program was based on it. Learning to paraglide first is an effective (and fun) way to get into the sport but there are significant extra techniques and emergency recoveries when power is added. Learning these is not part of the USHPA program. Learning them will make a huge difference in your success and survival in powered paragliding. To safely fly powered, you must get training from an instructor intimately familiar with the intricacies of motor flying and, even better, your specific brand. Paramotor pilots come to grief for completely different reasons than free flyers, hence the recommendation for thorough, qualified USPPA/USUA certified paramotor instructors who use the syllabus. A USHPA-only instructor who does extensive motor flying will likely know these techniques and emergencies but check around and make sure they use the USPPA syllabus. There are numerous USHPA and USPPA/USUA certified instructors out there. See our Dealer Map to contact many great Dealer/Instructors across the country. The USPPA also recommends using paragliders by one of the respected certification organizations such as EN, LTF, DHV, and DULV. Older gliders may be certified through AFNOR, APCUL, or SHV. The purpose of certification is to help insure minimum structural and flight characteristic standards are met. Even though most certification is intended for free flight, it still has relevance as a starting point for motor flying. 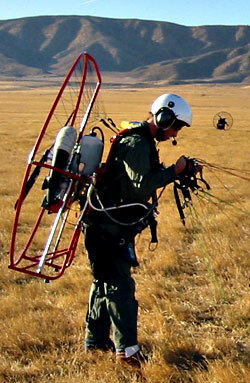 One caveat, some gliders, usually with a "reflex" profile, are designed to be collapse resistant. These may not meet certification standards since most certification standards rate recovery characteristics more than collapse resistance. Consult with your instructor and the paraglider manual about any potential glider purchase. It's a very affordable way to be part of something greater than yourself – if you receive some level of education or information as a result of your membership that you would not have otherwise known or found then it pays for itself every year. One of the things that I use to drive home the necessity is the prospect of this sport ever being regulated or requiring a license. If, down the road, we were ever required to have a license for paramotoring; I have proof that I've been a competent pilot since the date of my rating with USPPA. Those who go out on their own have no proof really. Will it matter? Who knows. There are other National Organizations having to do with ultralight aircraft, and these may be worth looking into as they are also interested in preserving the freedom we enjoy using our unique and personal flying machines. Please beware of so-called organizations that are nothing more than one man's way of promoting his own agenda and products. If you see only one motor that passes "certification", for example, the SHAM/FRAUD becomes quite obvious. If the DHV or LTF only certified one brand of paraglider, we would not have a sport! The World Powered Paragliding Association is nothing more than a slick way to promoite Flat Top products and Dell's agenda. The Truth is that it goes beyond unethical and disrespects legitimate organizations with blatant lies and fantasies dreamed up by it's owner, Dell Schanze. Doing business with U-TurnUSA, Paramotor Mall or even buying a new Flat Top Paramotor from any dealer selling them is an affront to every business and school out there trying to be even remotely honest in this game. Its a tough business and there have always been those willing to push the truth in various ways but never to this degree. Do yourself a favor, do your friends a favor, do the sport a favor and stay as far away as possible from dealing with this unethical sham that is Dell Schanze, U-TurnUSA and Flattop Paramotors. You can find certified instructors through the US Powered Paragliding Association which has officers and a training committee that has developed a program modeled after the US Hang Gliding and Paragliding Association. We've all heard... "there ain't no free lunch." Well its just as true for paramotor instruction. Also, the notion of "Free Training" gives the false impression that training has no value. It's an effective marketing tool, for sure, but precious few people get valuable training for free. An instructor who includes training in the cost of a purchase is training for the value of his markup—completely fair given the enormous work required to give good, thorough instruction on these craft. Self training usually incurs the greatest cost. It includes damaged gear, more injuries or the ultimate price. Even instruction has turned out to be dangerous but self training is way worse. Many self-attempters give up after scary experiences, frustration, equipment destruction or injuries. Training with friends is barely one notch above self training (depending on the friends) and is a huge imposition. There is a lot more to this than learning to kite and throttling up. An experienced, conscientious instructor using the USPPA/USUA syllabus will know what to look for, how to prevent the common maladies and have training aids to make it safer.. A pilot who leaves training with less than 5 flights is woefully underprepared, especially if the flights were assisted by the instructor on radio. How many flights did you complete before the instructor left town and you were on your own? How did you feel about your first flight after that? How did the next few flights go? How many flights do you have now? How much have you spent on replacing or repairing broken props, cage sections, or frames? Have you had any experience in which you were afraid, because you felt unprepared for the situation? Have you ever found yourself in conditions or a situation which you felt was beyond your skills, knowledge and abilities? Have you experienced any safety mishaps or injuries? Have you ever met another new pilot who seemed to have greater skills, knowledge, abilities, or confidence, than YOU did, at that stage of your flying career? Looking back at your flying career, so far, are there any areas that you wish had been covered more completely during your "training"? Is the potential for saving money, but feeling fearful and unprepared, better than the confidence that comes from being ready for whatever happens? Do I want to invest in my skills, knowledge and abilities to fly, or would I rather risk the cost and pain of repairs and injuries? Would having the confidence of REALLY knowing what I'm doing, help to eliminate fear, and add measurably to my enjoyment of flying? Would I (and the people in my life) feel better, knowing that I've covered all the bases, when it comes to learning how to fly safely, and being prepared to handle the unexpected? Most folks, if they've been in the sport a while, will tell you that you can pay for good instruction, or you can pay for broken props, bent cages and possibly some hospital bills.